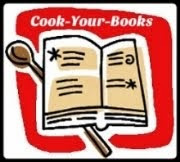 This week at Tuesdays with Dorie (TWD), we are baking Crispy-Topped Brown Sugar Bars, from Baking Chez Moi by Dorie Greenspan. These bars has a thin chewy cookie base, spread with melted chocolate and topped with Rice Krispies. Dorie has given a few ideas for the topping, if using Rice Krispies, it can be used plain, direct from the box or can be made extra special by caramelizing the Rice Krispies and pressing the brittle-like bits into the chocolate. Other suggestions for the topping are popcorns, mixed nuts, dried fruits, flaked coconuts and even slivers of Orange Candied Peel. I was feeling kinda lazy and decided to just use the Rice Krispies direct from the box. Well, Dorie did say that she sometimes use it straight from the box! Firstly the dough is made by creaming butter and sugar till light and fluffy, Add vanilla and flour, and mix till completely incorporated. Scrape the sticky dough into the prepared pan and spread it out evenly, as Dorie says it will be very sticky. I used the spatula and it works out fine. Bake in a preheated oven at 375F until it has puff and is golden brown. I baked mine for exactly 22 minutes, just as instructed in the recipe. Remove the pan from the oven and immediately scatter chopped chocolate bits all over. Return the pan to the oven with the oven turned off and allow the chocolate to soften in the heat for about a minute or two. Remove the pan from the oven and use the back of a spoon to press the softened bits of chocolate and spread it evenly all over the base. Scatter the Rice Krispies all over, pressing them into the chocolate. Allow to cool to room temperature. Again, just as Dorie says, the chocolate would still be runny and it would probably not set by then. Dorie advised to put the pan in the refrigerator for 20 minutes to set it in, and that was what I did. Slice the bars into 16 pieces. These bars are easy to slice. These bars are wonderful, makes a fun snack! The bottom base is a little crumbly, tender and buttery! I did reduce the sugar just a little, and the sweetness was just right, works out great with the melted chocolate and the crispy Rice Krispies. The next time, I would make the caramelized Rice Krispies, as I think that it would be even more yummier! And I am already thinking of making this again with other toppings! I'm thinking of toasted flaked coconuts which is one of my favourite ingredients! Yum! Yum! Thumbs up from the kids! I store them in a container and place in the refrigerator as the chocolate starts to melt when I left them at room temperature. But I have no problem with that, these bars taste so much better when eaten cold, straight out of the refrigerator! Yes, definitely try the caramelized rice crispies next time.... they take it to another level! When I saw this recipe in the cookbook I knew I'd have to make it soon. They look so good, Joyce! Your bars look perfect, Joyce! I love the last picture with the gooey melted chocolate. I baked a similar one with popped amaranth long time ago...it was great too. Yours looks fantastic! Rice Krispies .... I've not been buying these for ages ! These bars look so delicious. .. great as tea snack ! These bars have everything that I like... butter, brown sugar and CHOCOLATE!!! Every slice looks so irresistibly yummy. Your squares look perfect! And I love to eat sweets right out of the fridge too! I found these to be quite sweet, and thought that they could use a reduction in the brown sugar. Good to know it can be done. I bet these would be great with coconut!